The appropriate method for sharpening a knife depends on the quality of the steel. Many common kitchen knives made of stainless steel have relatively soft blades (52-56 HRC). Routine use causes the cutting edge to bend, making the blade dull. Sharpness can be restored by reforming the cutting edge with a burnisher. However, the durability of the edge still will be weak. For good edge retention, hard steel – like that used in Japanese kitchen knives – must be used. 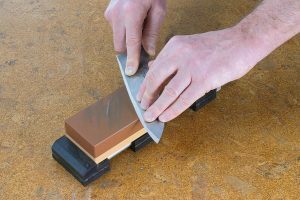 And since abrasion is required to sharpen hard steel, sharpening stones are the ideal sharpening method. 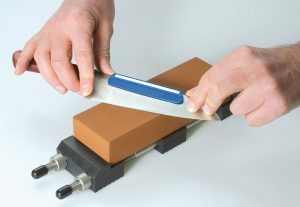 For sharpening knives, a waterstone with a grit size of about 1000 (e.g. No. 711008) should be used first. Soak the stone in water for a few minutes before placing it on a slip-proof surface (e.g. No. 705364). Position the knife blade diagonally on top of the stone at an angle as close to the recommended angle as possible. When guiding the knife, keep your fingertips away from the stone‘s surface to avoid scraping the skin and causing a painful injury. Pressure should be exerted on the cutting edge when grinding in both directions and extra care should be taken to keep the recommended angle as constant as possible. Rocking and tilting movements will round the bevel, creating uneven blade geometry. 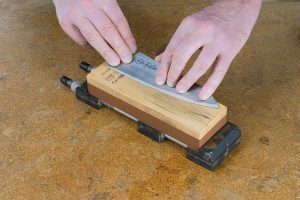 If you have problems with free-hand sharpening, simply put the Togeru knife sharpening device (No. 705377) onto the back of your blade. The handling of the knife is shown in the photo. allow you to treat your food with respect. The term honing refers to the process used to remove the burr created during sharpening. Before beginning, rinse the blade to remove the particle remains of the prior stone. For honing, use a stone with a minimum grit size of 4000. Place the blade lengthwise onto the stone and grind it in the direction of the cutting edge. At this stage, the blade can be held at a slightly steeper angle(1°-2°) than that used for grinding to ensure the burr is removed completely. As a rule, a few light strokes are required on each bevelled edge in alteration before the burr can no longer be felt with the fingertips. With increasing delicacy, reduce the amount of pressure placed on the blade – too much pressure will distort the finely ground cutting edge. When finished, rinse the knife thoroughly in warm water. Carbon steel blades should be treated with a little oil to prevent rust. If you rinse with water regularly, the stone has its highest efficiency. If you rinse less, some slurry will build up. This polishing paste may be welcome to smooth out the grit steps between the different stones. To see how the blade and the stone are interacting, look at the sharpening tracks on the wet surface of the stone. A balanced and rhythmic sound is another good indicator that the blade is being sharpened evenly. Sharpening on coarse or medium-grit stones creates a visible burr, which is later removed during honing. You can feel it with your fingertip if you run your finger over the bevel away from the cutting edge, applying slight pressure. Japanese knives with a bevel on only one side of the blade are slightly hollow-ground on the back side. 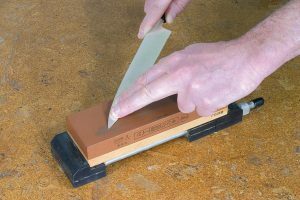 For this reason, only the cutting edge and the back of the blade should touch the sharpening stone when laid flat. Only the bevelled side should be sharpened, but both the bevelled and back sides should be honed. 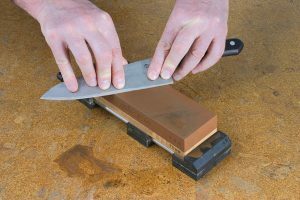 During honing, the entire surface of the blade can rest on the stone, whereas the surface of the sharpening stone must be absolutely flat. 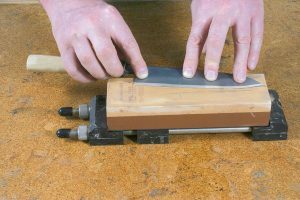 Standard, double-bevel knives require sharpening on both sides. 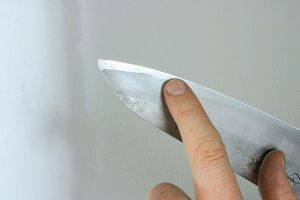 After the entire length of one side has been sharpened, turn the knife over and sharpen the opposite side – the handle is now held in the left hand. For blades that are simply dull from use, not damaged, about 20-30 strokes per side should suffice. To sharpen the tip of a knife, raise the handle until only the front of the blade touches the stone. Using one or two fingers, press the tip down and grind it lengthwise on the stone using a straight sharpening motion.